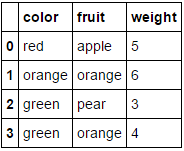 I'm trying to use scikit-learn's LabelEncoder to encode a pandas DataFrame of string labels. As the dataframe has many (50+) columns, I want to avoid creating a LabelEncoder object for each column; I'd rather just have one big LabelEncoder objects that works across all my columns of data. Throwing the entire DataFrame into LabelEncoder creates the below error. Please bear in mind that I'm using dummy data here; in actuality I'm dealing with about 50 columns of string labeled data, so need a solution that doesn't reference any columns by name. Any thoughts on how to get around this problem? Since this answer is over a year ago, and generated many upvotes (including a bounty), I should probably extend this further. For inverse_transform and transform, you have to do a little bit of hack. With this, you now retain all columns LabelEncoder as dictionary. As mentioned by larsmans, LabelEncoder() only takes a 1-d array as an argument. That said, it is quite easy to roll your own label encoder that operates on multiple columns of your choosing, and returns a transformed dataframe. My code here is based in part on Zac Stewart's excellent blog post found here. Note that it'll probably choke when it tries to encode attributes that are already numeric (add some code to handle this if you like). We don't need a LabelEncoder. You can convert the columns to categoricals and then get their codes. I used a dictionary comprehension below to apply this process to every column and wrap the result back into a dataframe of the same shape with identical indices and column names. Represent each pair as a string version of the tuple. This is a workaround to overcome the LabelEncoder class not supporting tuples as a class name. Fits the new items to the LabelEncoder. Remember that each lookup is now a string representation of a tuple that contains the (column, row). Fit label encoder to pandas columns. Fit label encoder and return encoded labels. No, LabelEncoder does not do this. It takes 1-d arrays of class labels and produces 1-d arrays. It's designed to handle class labels in classification problems, not arbitrary data, and any attempt to force it into other uses will require code to transform the actual problem to the problem it solves (and the solution back to the original space). @return label encoded and inverse tranform of the label encoded data. # concatenation NaNs will be introduced. Data to use for fitting. In many cases, should be ``X_train``. This class fits the encoder on the training set and uses the fitted version when transforming. Initial version of the code can be found here. It is possible to do this all in pandas directly and is well-suited for a unique ability of the replace method. First, let's make a dictionary of dictionaries mapping the columns and their values to their new replacement values. Since this will always be a one to one mapping, we can invert the inner dictionary to get a mapping of the new values back to the original. Now, we can use the unique ability of the replace method to take a nested list of dictionaries and use the outer keys as the columns, and the inner keys as the values we would like to replace. Note: This technique is good if you are not interested in converting them back. I checked the source code (https://github.com/scikit-learn/scikit-learn/blob/master/sklearn/preprocessing/label.py) of LabelEncoder. It was based on a set of numpy transformation, which one of those is np.unique(). And this function only takes 1-d array input. (correct me if I am wrong). Very Rough ideas... first, identify which columns needed LabelEncoder, then loop through each column. The returned df would be the one after encoding, and label_list will show you what all those values means in the corresponding column. This is a snippet from a data process script I wrote for work. Let me know if you think there could be any further improvement. Then to re-use in the future you can just save the output to a json document and when you need it you read it in and use the .map() function like I did above. The problem is the shape of the data (pd dataframe) you are passing to the fit function. You've got to pass 1d list. Here i am reading a csv from location and in function i am passing the column list i want to labelencode and the dataframe I want to apply this. What is the difference between OneVsRestClassifier and MultiOutputClassifier in scikit learn? How to use Imputer in a DataFrameMapper on a dataframe?